Common Foods to help whiten your teeh Naturally. Has your diet and dental habits left you looking for a solution to stained teeth? Maybe you’re on the looking for a natural way to restore the whiteness of your pearly whites. 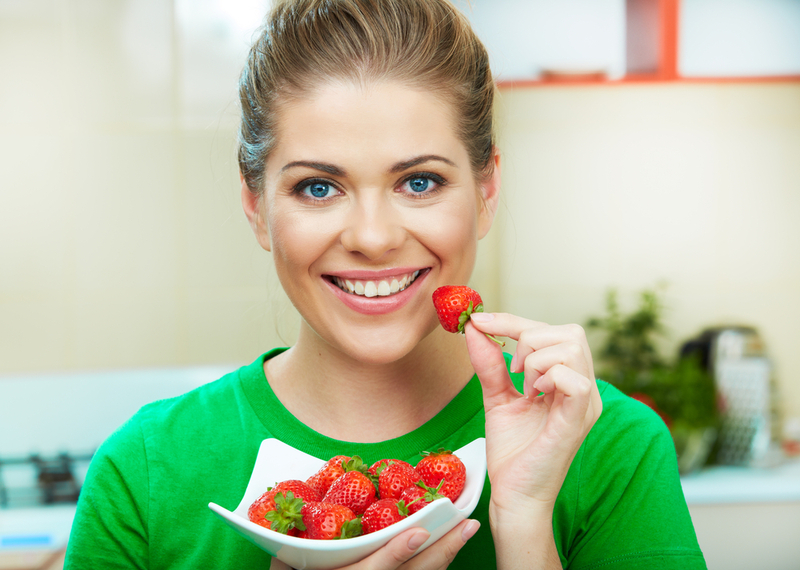 The good news is that you can brighten your smile naturally just by eating the right foods. Although this isn’t a substitute for professional teeth whitening, it’s an excellent way to take extra care of your oral health. Here are 6 foods you can turn to for a naturally whiter smile. Rather than cooking this green veg, toss some raw florets into a salad and your teeth will get a good scrub as you chew them. The high iron content brings benefits too, as this helps to protect your enamel from harmful bacteria. You might think that eating a big red fruit would stain your teeth, but strawberries have a secret. These juicy treats contain a chemical called malic acid that acts like natural bleach for your teeth, helping to remove surface discoloration. Dairy products are an excellent source of calcium, which is essential for keeping your teeth and gums healthy as well as promoting teeth whitening. In addition to this, the lactic acid in cheese protects your teeth from decay, keeping them brighter for longer. As with all crunchy fresh fruit and vegetables, the abrasion from biting and chewing an apple helps to scrub away at stubborn stains over time and give you a brighter smile. In addition to this, the acidity of apples works as a mild astringent to remove plaque and clean the gums. These mushrooms contain a natural sugar compound called lentinan that inhibits the growth of bacteria in your mouth, reducing the build up of plaque. It works in a clever way to eliminate unwanted cavity-causing bacteria while leaving the beneficial bacteria to do its work. It may sound obvious, but staying hydrated isn’t just good for your skin and metabolism, it’s important for your oral health as well. Water helps to balance the pH levels inside your mouth to reduce acidity. Drinking it with a meal both cleans out unwanted debris and prevents stain build up from darkly pigmented food or drink. If natural methods aren’t enough and you’d like to book professional teeth whitening service in Joondalup, call Anchorage Dental now on (08) 9407 7888 or contact us online for more information.